I’m not quite sure how or when Albania fist came onto my radar. A passing recommendation from a friend, a longstanding love for the Balkans, a yearning for the sunshine after the long and dreary winter and a soon-to-expire Schengen visa meant it all just kind of fell into place. 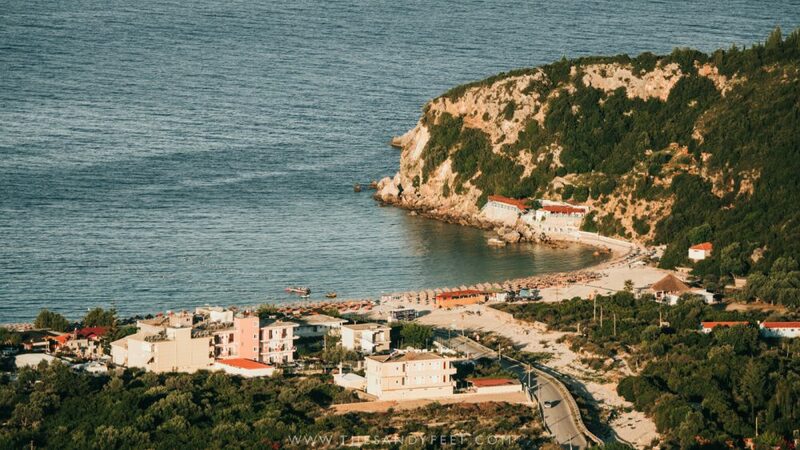 Tourism in Albania is still very much in its infancy, and while this meant that plans were often chopped and changed with the weather and whim of every bus driver, it was exactly the type of unpredictable adventure that I craved. Between the rugged cliff lines that tumble into impossibly turquoise seas, ancient Ottoman towns that clamber up hillsides and wild mountains that call to be explored, it’s a place with something to satisfy every type of traveller, and one that has happily found a home among my favourite destinations in Europe. Things won’t stay this way for long though. 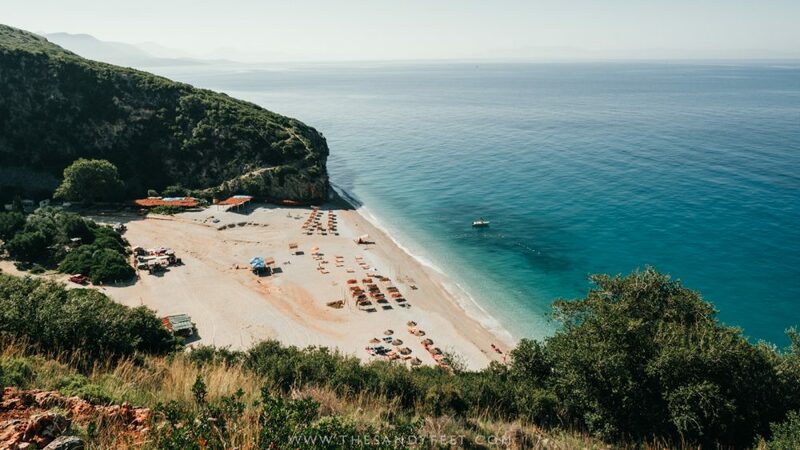 Much like Croatia and Montenegro that have boomed in popularity in recent years, Albania won’t be far behind, and considering it was recently chosen for in Lonely Planet’s Best In Travel for 2019, change will likely come quickly. 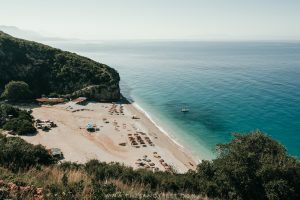 After a blissful six weeks in the country, these are my picks for the best things to do in Albania. In many ways, Tirana was not at all what I expected. It was so much better. A flurry of chaotic streets and honking horns interspersed with colour-washed plazas and leafy parks. Where gritty back alleys conceal trendy cafes and authentic eateries alike, and reminders of the country’s tumultuous past can be found on every pavement. 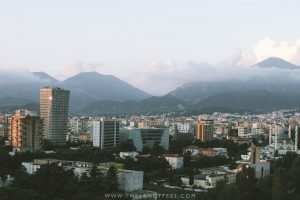 And when the frenetic energy of Albania’s capital proves a little too much, the mountains are just a cable car ride away. Between the commotion and the colour, it was a place that, above all else, felt completely alive; bounding along unashamedly to the beat of its own drum. 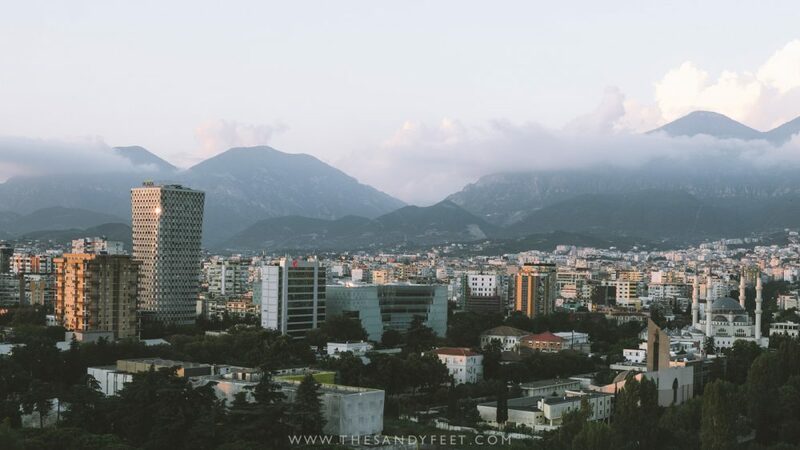 Not everyone falls for Tirana, but if, like me, you’ve arrived knowing very little of Albania’s story, Tirana makes an excellent place to begin your adventure. Lazy sun-drenched beach days, spectacular clifftop hikes and more delicious seafood than you can shake a stick at. With so much to love, it’s hardly surprising that laidback Himara has quickly become a favourite backpacker haunt along the coast. Set between rolling hills, the white-washed village streets and abundant fruit trees roll toward the bay where fishing boats bob lazily in a tranquil sea, colourful umbrellas dot the shore and timeworn villas provide a much-needed retreat from the blazing summer sun. It’s the type of place that won’t stay the same for long – development along the Riviera is booming after all – but for now, it still retains plenty of beach town charm. 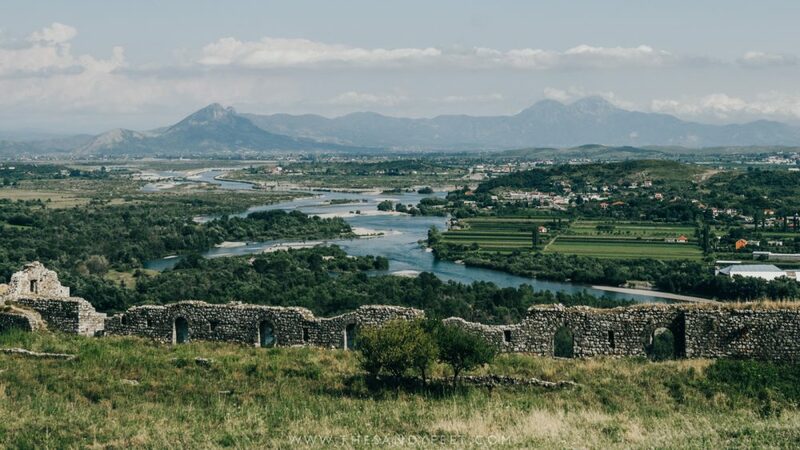 After the hectic streets of Tirana, Shkodra feels like stepping back in time. Big wooden shutters hang lopsided along pastel streets, leathery-faced men peddle unhurriedly on their rickety bikes and cafes sprawl across pedestrianised boulevards. Despite the charm of the town, however, it was an afternoon spent cycling along the glistening shores of the Lake Skadar that become my favourite memory of the place – where deliciously plump figs swayed overhead, barefooted children ran carefree through the streets and well-travelled Lada’s collected dust in the shadows. You know me, if there are mountains nearby, that’s probably where I’ll be. 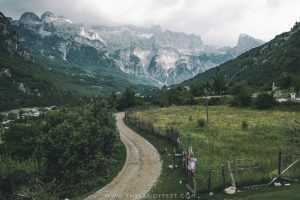 Like many others, I set off for the Albanian Alps to hike the much-loved Theth to Valbona trail, but as it turned out, it was on my way to the Blue Eye as I zigzagged through forested valleys and remote mountain farms and hopped across bone-chilling rivers that I came to appreciate how beautiful this corner of Albania truly is. Love a good adventure? 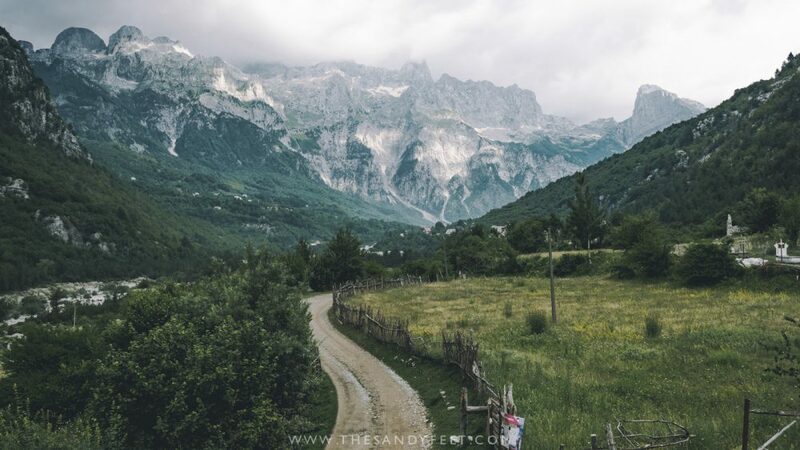 The Albanian Alps should be an essential stop on your itinerary. 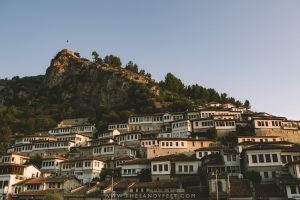 You simply can’t visit Albania and not stop at one of its pocket-sized and extraordinarily charming Ottoman-era cities. For most, that means Berat. 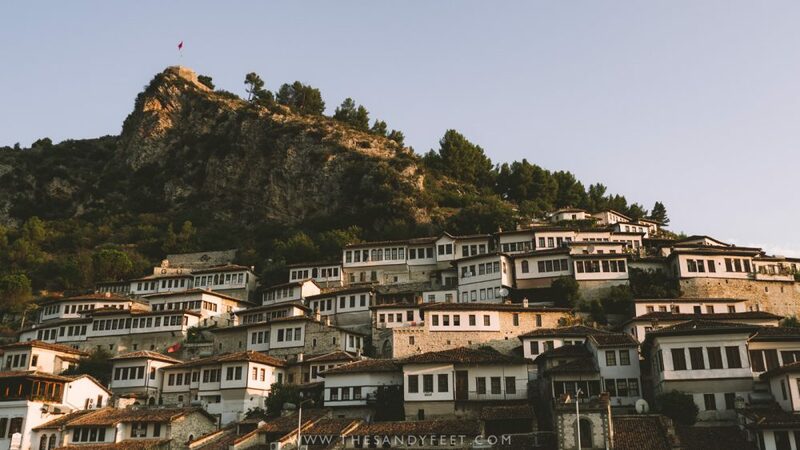 Clinging tightly to the banks of the Osum River, Berat is a veritable labyrinth of impossibly pretty alleyways and hidden staircases that climb toward the hilltop castle that serves up incredible views. This is certainly a place to forget the map, follow your feet and get as unbelievable lost as I did. Cascading down the steep slopes of the Gjerë Mountains, Gjirokastra makes a striking first impression. 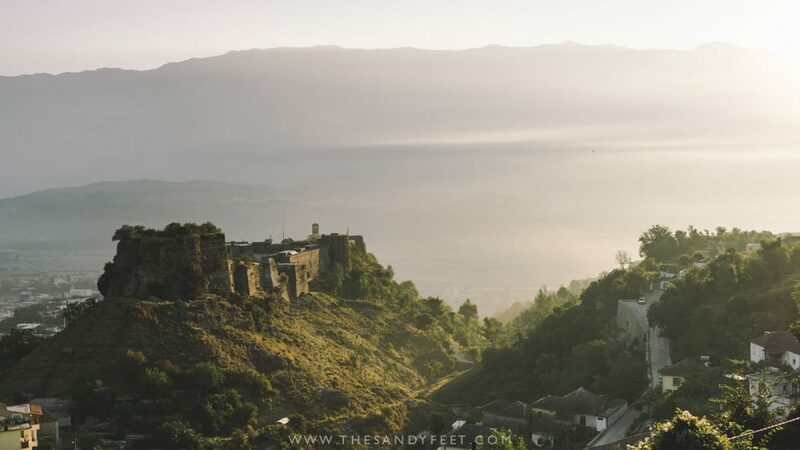 Standing guard across the verdant Drino Valley, the imposing Gjirokastra Fortress dominates the skyline amidst a sea of slate grey rooftops that hide a maze of cobbled alleyways and staircases simply made for wandering. 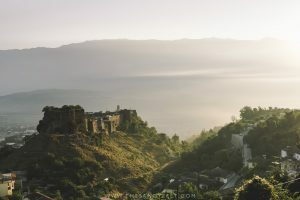 While Berat is often said to be the prettier of Albania’s most famous Ottoman cities, Gjirokastra most certainly takes the cake when it comes to location. Tourist infrastructure in Permet is still very much in its infancy, but even so, the area is ripe for exploration. 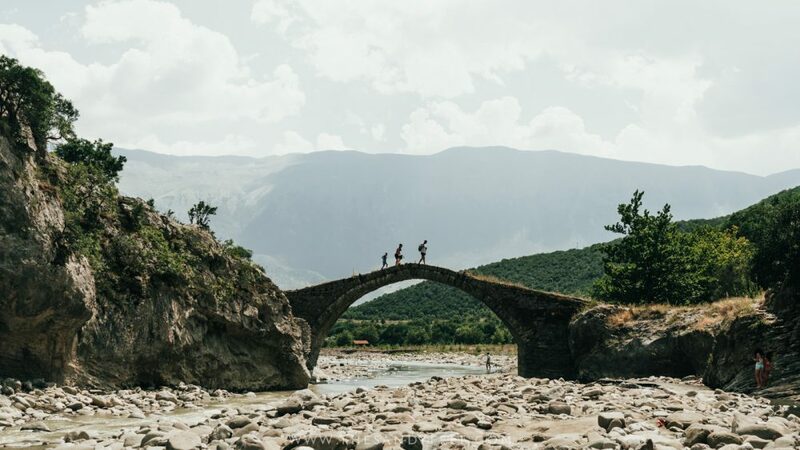 Nestled among lush forested hills that conceal all manner of hot springs, river rapids and unnamed hiking trails, it won’t be long before Permet takes up its well-deserved place on Albania’s growing backpacker trail. Dotted along Albania’s coastline of craggy cliffs and iridescent blue lie some truly fantastic spots. Set amidst a remote pocket of bushland, Gjipe Beach gets my pick of the bunch with a stunning turquoise bay, a curious network of caves and the towering ochre cliffs of the Gjipe Canyon leading directly off the pebbled shore. It may not be the secret it once was, but it’s definitely a beautiful spot to while away the day. Nearby Porto Palermo was another firm favourite, with a 19th-century castle and a fantastic restaurant right alongside the beach for when the baking summer sun proves a little too much. I’d never really planned to stop at Korçë during my time in Albania, but as I trundled down the crumpled road out of Permet, bound for the spectacular pass that leads through Leskovik, it seemed like the only logical stop. 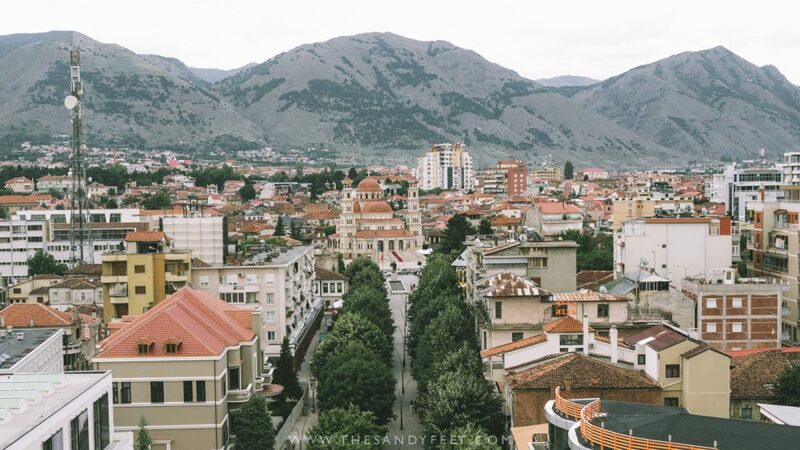 It’s a place that sees few international tourists, but on a rainy day in July, its sprawling courtyard of friendly cafes, a beautiful city viewpoint and one of the best meals I ate in Albania was all I needed to enjoy this charming little town in Albania’s south. 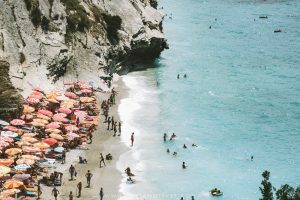 The overwhelming summer crowds that descend on this perennially popular part of the country meant that Saranda and I perhaps got off to a shaky start. 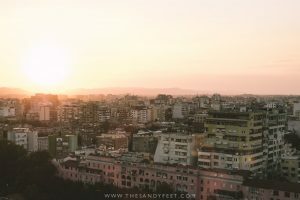 Out of season, I think we would have gotten on a little better, but regardless, the city makes an excellent jumping off point for exploring Albania’s south. 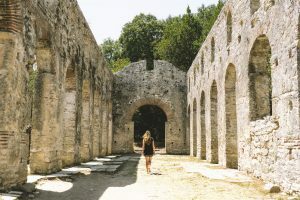 History enthusiasts will love the well-preserved ruins of Butrint National Park, while those still craving a daily dose vitamin D need look no further than the stunning bays in and around Ksamil. Though Pogradec had long held a place on my itinerary, a last minute change of plans saw me hop across the border to Macedonia to enjoy the lakeside views from Ohrid instead. Still, the sandy shores of Pogradec look to be a relaxing place to spend a day or two, especially if you’re transiting across the border which can be a rather long-winded affair. 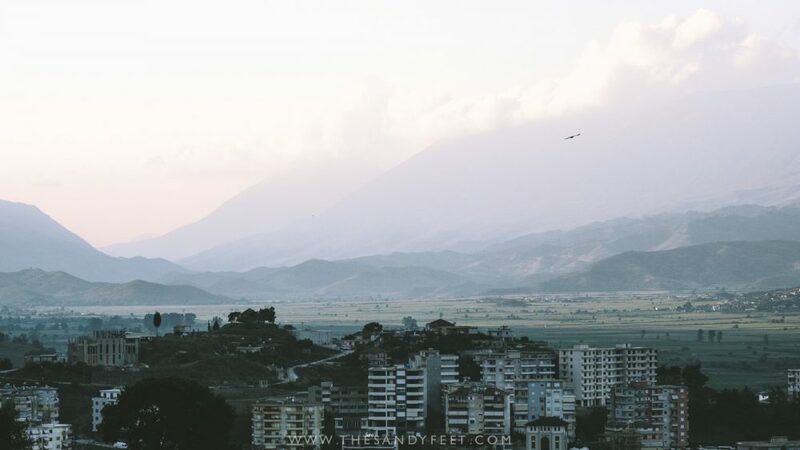 If you’re travelling to Albania by plane, chances are you’ll be arriving at Tirana’s International Aiport. 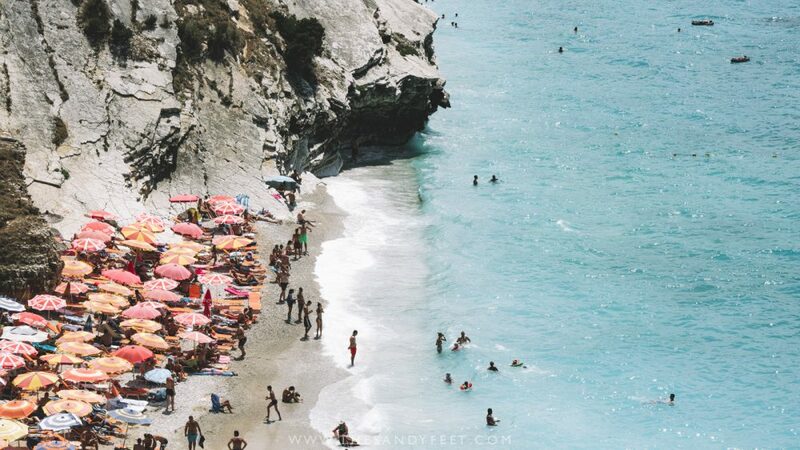 Flights here can be surprisingly expensive though so it’s often more economical to fly into Corfu airport instead and catch the ferry across to Saranda to begin your Albania travels. Find the best flight deals on Skyscanner here. For lovers of slow travel, another option is to take an overnight ferry from Italy which lands at Durres, one of Albania’s major ports. Check ferry schedule for Albania here. For those travelling overland, Albania is well connected to its neighbours by bus with several routes stretching between Greece, Montenegro, Kosovo and Macedonia. Tirana and Saranda act as the main transport hubs. 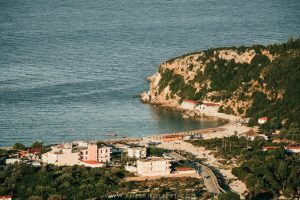 Travel in Albania isn’t always a smooth ride – buses tend to only leave when full, schedules can change at the drop of a hat and somedays, things can grind to a screeching halt altogether, but that’s pretty much just part of the adventure. Aside from one day where I ended up unexpectedly in the middle of nowhere with a storm brewing overhead and no bus in sight, the whole getting around thing actually went far smoother than I had expected. Just get used to things coming and going as they please. Buses and furgons – minivans that range from clean and modern to rickety, brightly coloured tin cans – will be your bread and butter if you’re travelling by public transport. Most cities and towns have a centralised bus area, often with the expected schedule. If you’re somewhere along the way, simply flag down the bus you’re after. If you’re pressed for time, much easier is to rent a car to explore the gorgeous coastline, tiny villages and mountainous countryside which affords you the flexibility to stop off at every pretty cove and epic view that passes by your window. There are also a number of fantastic drives, such as the spectacular Llogara Pass, and the road between Permet and Korce via Leskovik. Trust me, they’re well worth it! It’s also worth noting that Albanians tend to drive rather maniacally, and while I thought they were a touch better than those in Montenegro, common sense and safety are most certainly not the highest priority when getting behind the wheel. Check rates on car rental in Albania here. For serious shoestring travellers, hitchhiking is also a fairly common way of getting around, particularly along the coast. Some roads receive very little traffic though so be sure to have a backup plan. As recognised by Lonely Planet, Albania is one of the best value destinations in Europe, which makes it all too easy to say yes to that daily ice-cream, lavish boat trip and second (or third) glass of wine. Albania is a cash economy though – I managed to use my bank card just once during my six weeks here – so always be prepared with hard cash in the local currency. You’ll find ATMs in all major cities, and while many will try to charge a withdrawal fee, there’s always one that is free to use. Unfortunately, Albania seems to have something of a reputation – one of drug lords, mafia men and a whole lot of seedy underground activity. In fact, the number of people who looked at me horrified when mentioned I was going or had just been there was both slightly worrying and rather hilarious. 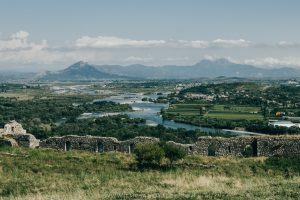 Sure, Albania has had a challenging past and in some of its neighbouring countries this reputation isn’t exactly unfounded, but as a whole, this is a tiny part of a complex and incredibly beautiful country, one that the vast majority of travellers will not in any way encounter. Travelling as a solo female, I felt completely safe throughout the country and, apart from the odd leery eye and lewd comment, I encountered some of the friendliest and most hospitable people of anywhere I’ve been. Like most Balkan countries, meat is a staple of Albanian cuisine, but refreshingly they also specialise in a number of delicious vegetarian dishes far superior to the usual side salad. Stuffed eggplant, baked cheeses and excellent seafood, dining in Albania was something of a revelation. Albania’s flourishing slow food movement, introduced by some of the country’s keenest restauranteurs, has also brought about something of a food revolution which embraces a wholesome farm-to-table approach and celebrates locally sourced organic ingredients and culinary traditions. Heading to Albania? Start Planning With These Helpful Guides. Never knew Albania would be so hilly full of mountains! The Albanian Alps looks like a hoot to hike! Excellent summary of the country. One of these days, I’ll have to get there! Thanks Pete – definitely a place worth getting to soon! The mountains completely took me by surprise as well. The peaks in the north are stunning, but the central area is full of them as well. So much more to be explored there! Wow! Stunning pictures. Albania is definitely on my bucket list now!